Adhesive – This is the paste or the gum that you can see behind the stamps. It helps the stamps stick to the envelopes. Centering – This terms refers to the stamp position in its perforation. Commemorative Stamps – These are stamps printed in celebration of any special events. They are sold for a limited span of time mostly. Definitive Stamps – Also known as common postage stamps. Face Value – This is the denomination that one can see on the stamp. Hinge – Helps attach stamps in stamp albums. Imperforate – These are stamps that do not have perforations. Margin – This is the area that surrounds the design of the stamp. This area and the stamp design must be equal. More often than not, the value of the stamp is directly proportional to the number of margins. Perforations – These are the cuts or holes that one can see between stamps. They facilitate easy tearing of the stamps. 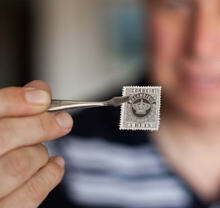 Philately - The study of stamps. Postmark – The post office marks on used stamps to avoid re-usage of the same stamps and this marking is called the postmark. It is a crime to mail an item with a postmarked stamp. Reprint – The post office often prints stamps with the same design as any previous stamp. These are called reprints. Stock Book – Also known as stock page. It has a glassine or plastic cover and helps you store stamps. The cover secures the stamp in place. It is transparent and thus, you can see the stamps without having to remove them. Tongs – These tweezers are used to handle stamps. They have rounded tips. Watermark – This is an emblem or a mark that you can find on the stamp. To make this, the paper is thinned.